HMP Year One: a Look Back — Healthcare Counts! After the decision by Michigan’s legislature to expand Medicaid to cover more adults, we geared up to for April 1st, 2014 start date. Partnering with other local agencies, we promoted the Healthy Michigan Plan through fliers, advertisements and mailings. It was difficult, though, as the national message told people to access coverage by March 31st, which marked the end of Marketplace enrollment. As folks strolled through our doors too soon, we sent them away with a reminder to stop back in again in April, and assured them they would be able to enroll. Opening Day: April 1st, 2014 was incredibly draining. We had staff posted in two counties (Washtenaw and Livingston), with laptops charged, stacks of information sheets and plenty of coffee. One newer staff member had been trained on the application process but hadn’t actually sat down with someone to fill one out until that day! Staff in Washtenaw County began sending people away mid-afternoon to ensure that everyone in line would be processed by closing time. The rest of the week didn’t provide much relief, as people continued to flood in with excitement about their new health coverage opportunity. Spring and summer flew by assisting one person after another with filling out their Medicaid application, and often the same folks would come back with they had questions or problems. We strengthened our connections with caseworkers at the Department of Human Services to provide the best service we could with our mutual clients. As things slowed down a bit in the fall, we decide to increase our advertising, and hopped on board with the national Get Covered campaign. 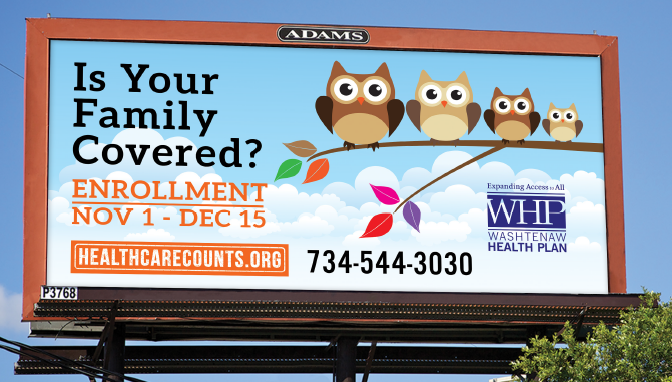 Donations from Adam’s Outdoor Advertising and the Ann Arbor Area Transportation Authority allowed us to bring up four billboards throughout town and plaster posters on local buses in hopes to remind them to access health coverage. We also created healthcarecounts.org to provide a place to find answers to questions we see often, so that people may not have to make it all the way to our office to find them. The Healthy Michigan Plan created the opportunity for many adults to become eligible for free coverage through the State that had not been able to access it before. As of March 30th, 2015, there are 603,681 beneficiaries enrolled in the Healthy Michigan Plan. The WHP is proud to have assisted 5791 individuals with enrollment into several Medicaid programs, including the Healthy Michigan Plan, in the last year. With one year down, and many more in the future, we are excited to continue to be the go to spot in our community for accessing health coverage!